Definition at line 51 of file desktop.h. Definition at line 53 of file desktop.h. Definition at line 313 of file desktop.cpp. Definition at line 319 of file desktop.cpp. Definition at line 326 of file desktop.cpp. 343 // Without this the desktop has mysteriously only a size of 800x600 pixels. Definition at line 73 of file desktop.h. Definition at line 60 of file desktop.h. Definition at line 350 of file desktop.cpp. Definition at line 509 of file desktop.cpp. Definition at line 66 of file desktop.h. Definition at line 78 of file desktop.h. Definition at line 431 of file desktop.cpp. Definition at line 88 of file desktop.h. Referenced by Create(), Init(), and WndProc(). Definition at line 87 of file desktop.h. 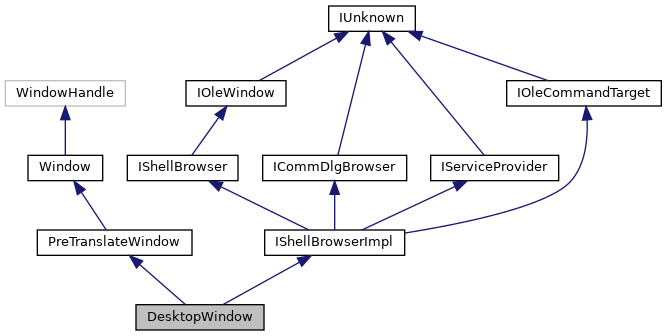 Referenced by DesktopWindow(), Init(), QueryActiveShellView(), WndProc(), and ~DesktopWindow().